https://sep.yimg.com/ay/yhst-33477391359232/brain-platygyra-coral-platygyra-species-green-maze-coral-brain-worm-platygyra-coral-bowl-coral-closed-brain-coral-pineapple-coral-7.jpgBrain Platygyra Coral - Platygyra species - Green Maze Coral - Brain Worm Platygyra Coral - Bowl Coral - Closed Brain Coral - Pineapple CoralEasySemi-aggressiveYesCalcium, Strontium, Trace elementsSouth Pacific, Indo-PacificFaviidaeSmall 2" - 3"
Brain Platygyra Coral is a valid candidate for the addition to your marine aquarium. Even beginner aquarists can try their hands on Brain Platygyra Coral. Quite hardy, easy to maintain and its beautiful appearance in actinic lighting qualify Brain Platygyra Coral for your marine aquarium. The article touches the various areas of interest about Brain Platygyra Coral that may affect the coral�s growth and maintenance in your marine aquarium. Other names: Brain Platygyra Coral belongs to the Family Faviidae and the Genus Platygyra. The scientific name of Brain Platygyra Coral is Platygyra species. The other common name of Brain Platygyra Coral is Brain Worm Platygyra Coral, Brain Maze Coral, Bowl Coral, Pineapple Coral, Green Maze and Closed Brain Coral. Coral Type: Brain Platygyra Coral is a Large Polyp Stony (LPS) Coral. Origin or natural range: Brain Platygyra Coral originates from the Indo-Pacific and the South Pacific regions of Tonga. 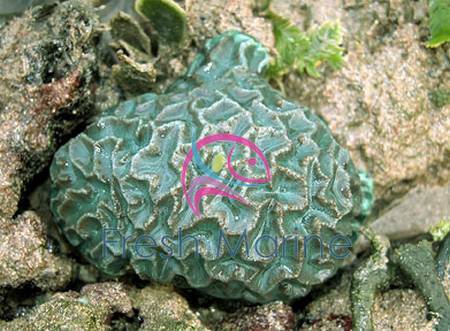 Color: Brain Platygyra Coral occurs in green, yellow, brown, cream, tan and grey colors. Morphology: Brain Platygyra Coral is quite hardy. The Platygyra species has a calcareous skeleton with channels resembling a maze in appearance. Brain Platygyra Coral is colonial in nature. The colonies of the Platygyra species are large and shaped like a dome or are flattened with ridges in contrasting shades. Brain Platygyra Coral has sweeper tentacles. The Platygyra species secretes a considerable amount of mucus due to which detritus deposits on its outer surface that needs to be cleaned regularly. The appearance of Brain Platygyra Coral may, however, vary owing to its surroundings, water current around it and the depth of its existence, etc. Compatibility: Brain Platygyra Coral is semi-aggressive towards the other members in your marine aquarium. Habit & Habitat: The Platygyra species forms large colonies that are dome shaped or are flattened. Brain Platygyra Coral is nocturnal in habit and spreads its tentacles at night. Temperature: The temperature inside your marine aquarium should range between seventy-two and seventy-eight degrees Fahrenheit. Specific gravity: The specific gravity of the water in your marine aquarium should be maintained within the range of 1.023 to 1.025.
pH: The pH value of the water in your marine aquarium should scale between 8.10 and 8.40. Illumination: Brain Platygyra Coral requires moderate lighting in the marine aquarium it inhabits. Actinic lighting is recommended for the Platygyra species as its structure is highlighted beautifully in the light. Water flow in the aquarium: The water flow in the aquarium hosting Brain Platygyra Coral should be moderate. Marine aquarium habit & habitat: You can place Brain Platygyra Coral anywhere in your marine aquarium. Keep Brain Platygyra Coral away from the other corals so that they do not obstruct the Platygyra species when it spreads itself fully. Feeding & Nutrition: Brain Platygyra Coral is Carnivorous in its feeding habits and filter feeds when opens in the evening. The Platygyra species eats brine shrimp, meaty bits, acellular marine invertebrates, zooplankton and phytoplankton. Add Strontium, Calcium and trace elements in the water as dietary supplements to Brain Platygyra Coral. It is easy to maintain Brain Platygyra Coral. Brain Platygyra Coral secretes a lot of mucus due to which the detritus deposits on its surface. If the surface of Brain Platygyra Coral is not cleaned regularly, it may die. Caution: Brain Platygyra Coral may damage any marine aquarium invertebrate that comes in its contact when the Platygyra species is spreading itself.